Broadly there are three categories of health namely physical health, mental health and spiritual health. The health of all body parts is called physical health, state of mind, thought process, happiness and peace of mind considered under mental health and keeping mind in high spirits with control over the senses is called spiritual health. All these three kinds of health are equally important to keep ourselves high valued life on this earth. Physical health is the overall condition of a living organism at a given time, the soundness of the body, freedom from disease or abnormality, and the condition of optimal well-being. People want to function as designed, but environmental forces can attack the body or it may have genetic malfunctions. The main concern in health is healing damage caused by injuries and biological attacks. As our body is a life time vehicle for us, it is our primary responsibility to keep it in good condition with good health and use it for good purpose / cause. E. Exercise: Maintaining regular exercise minimum 30 minutes a day. · Laziness: lack of proper self motivation and wasting the time with more sleep / sticking to TV etc. Remember one thing that your body and mind are the most valuable assets for you. So keeping yourself healthy is most important to achieve any thing in your life. You can go to any extent to do this & always apply the knowledge to your life to implement best practices. We may know these facts, but it is important to put them in practice with lot of commitment and determination from your side. Good health helps to solve any kind of problems in our day-to-day life as it is rightly said healthy mind resides in healthy body. Gotdiet is your authoritative source for weight loss programs. See the most popular diet plans and coupons to help you get started on your journey to improving your health and vitality. Detailed sections on children health, alternative medicine, birth control, mental health etc. 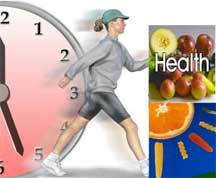 An extensive health portal offering loads of information on anything ranging from diseases, disorders, nutrition etc. Features online health centers on aids, cancer, cardiac problems, allergies etc. Worlds biggest Internet Health library. One stop health resource on net. Provides free online medical consultation, free treatment, health magazine, directory of doctors etc. Provides information in the areas of fitness, childcare, gynaecology. Includes doctors database, creates medical history records, live chats with doctors etc. The site allows for exchange of technical and clinical database between doctors, hospitals etc.Includes discussion boaards, chat, seminar info, medical news etc. Looking to get fit? Here's a helpful site that offers lots of useful info about exercising, eating right, losing weight, building muscle, supplements and more. This site is chock full of news, health advice, product reviews, automated drug checkers and local resource guides.